I wonder whether this is a result of living life, considering us humans separate from the Universe. When we think we are higher than the natural forces, there comes a tsunami or earth quake to make us realise our vulnerability. We exist in the solar system and we need to live in accordance with the sun’s movements to have a balanced life. Sun has a major role in balancing the Melatonin/ serotonin production in the body. These chemicals regulate our sleep and feel good factor. Getting up before sun rise and going to sleep at a reasonable time is important from this aspect. Of course it is impossible to get up at sun rise and go to sleep at sun set, which our ancestors did, in today’s life style. It is because of earth’s gravity that we can stay on its surface, or we all will be just thrown off into the atmosphere. Similarly, each planet has an influence on our lives. Have you noticed how the sea water behaves on new moon and full moon days? Tides are highest during the new moon (when moon and sun pull in the same direction) and during the full moon (when they pull in opposite directions). 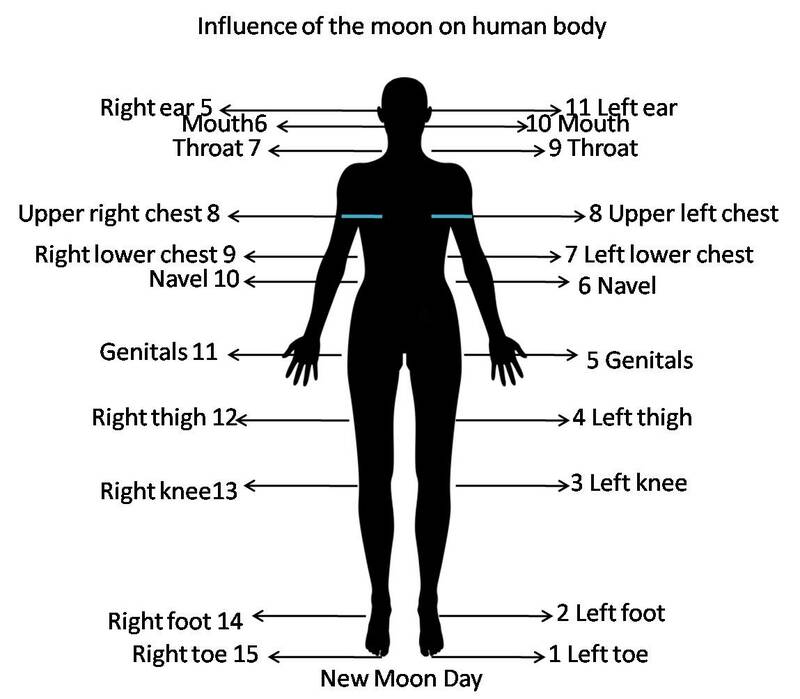 When we remember that the average adult human body is 50-65% water, it is easy to understand that new moons and full moons affect our body too. Siddhars are a type of saints in India who are said to have had many powers and achieved a ‘god-like’ state through specific secret practices that were known only to them. These powers spanned from controlling time and space, to transforming the body, manipulating matter at the molecular level and achieving immortality. They were endowed with ashta siddhis and ten secondary siddhis. I had the opportunity to do a course on Siddha medicine and got very important information from the course. They say that the lunar region or the ‘Chandra Mandalam’ is in the head. 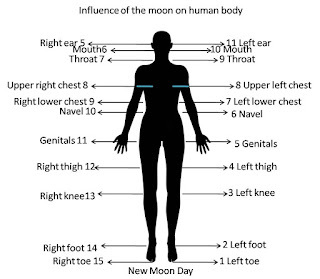 There are 30 places which are the seats of nectar in the human body, and they are influenced by the waxing (growing) and waning (decreasing) of the moon in the sky. It is better to avoid surgeries on the body parts when the nectar is present on the area as there may be delayed healing. The lunar eclipse takes place when the shadow of the earth falls on the moon and the three celestial bodies - the sun, the earth, and the moon - fall in a line and plane. The physical phenomenon involving the three celestial bodies does have some impact on human health. It may affect sleep as the intensity of moonlight will be seemingly more during the night because of a lunar eclipse. The increased presence of light outside can cause a disturbance in our sleep pattern, which can manifest itself as feeling lethargic and stressed on the following day. In the medical science, a man is called a ‘lunatic’, and the hospital where they are treated is called a ‘Lunatic Asylum’. Again the word ‘lunacy’ means a kind of madness, which aggravates on full moon days, proving that the lunar region is the head on full moon days. The increase in the subtle basic Raja-Tama in the atmosphere during the period of an eclipse affects food as well as the digestive processes. Hence it is advisable to avoid food during the period of the eclipse, or have light meals. Due to the potent energy released by an eclipse, emotions (both positive and negative) can be heightened and mishaps can happen. So it is important to be mindful of our thoughts, words and actions. There is an inward pull on our consciousness during eclipse, making it ideal time for spiritual practice. People who make the effort to do intense spiritual practice during the time of an eclipse will benefit up to 30 % more spiritually. It is a good time to do chanting and meditation. WowW! Excellent information... Thanks aunty.